A controversial proposal to use provisional ballots to stanch voter fraud is winding its way through the state Senate. The bill would introduce — for the first time in state history — provisional ballots to Minnesota elections. Provisional votes would be cast, then set aside until a challenged voter’s eligibility is reviewed by election authorities and either affirmed or denied. Officials would have seven days to make that decision. The provision was initially introduced as part of a stand-alone bill, Senate File 1225, authored by Sen. Mary Kiffmeyer, R-Big Lake. It has since been rolled into Kiffmeyer’s much larger election omnibus bill, Senate File 514. Yet it consistently takes center stage in committee deliberations. “Voters who have a status challenge on Election Day cannot cast regular ballot but are allowed to cast a provisional ballot,” Kiffmeyer, who was secretary of state from 1999 to 2007, said in explaining the bill to senators last month. The omnibus bill containing the concept passed the Senate’s State Government Finance and Policy and Elections Committee on Feb. 27, and the Senate Judiciary and Public Safety Finance Committee on March 1 — both by straight party-line votes. It is now on its way to Local Government. Supporters like Andy Cilek, executive director of the Minnesota Voters Alliance, say provisional ballots are needed to ensure Minnesota elections’ integrity. 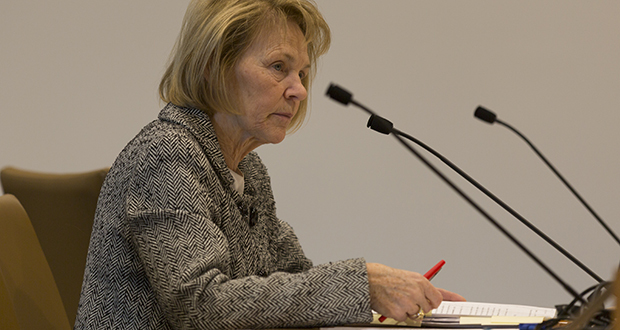 Local and state House elections in Minnesota sometimes are decided by razor-thin margins, Cilek told the State Government Finance committee members on Feb. 27. That makes it crucial for constitutionally ineligible voters — noncitizens, convicted felons and court-declared mental incompetents among others — to be prevented from voting, he said. Currently, voters whose ineligibility is flagged on election judges’ poll rosters can certify their eligibility under oath. If they later are found to have illegally cast a ballot, they can be charged with a felony. But that’s not enough for Cilek. Just as is the case now, the new law would require updated eligibility data from the State Court Administrator, the Department of Corrections and the Department of Public Safety to be matched against information in the Statewide Voter Registration System. That would be conveyed to polling places to flag voters which voter might be ineligible to vote. The biggest change would be election judges’ response to the data. No longer would a red flag trigger questioning under oath. Instead, election judges would have to offer the voter a provisional ballot. Among its other provisions, the law would institute a notification system telling voters if their eligibility is either suspended or restored, so that the news does not come as a surprise on Election Day, Kiffmeyer said. The changes are not needed, Simon said. The old system has worked well historically, partly because it has teeth. Law enforcement and county officials vigorously follow up with voters who swear eligibility, Simon said. If they are found to have lied and cast ineligible votes, they face prison time. Under Kiffmeyer’s plan, however, the election judge would offer the voter a provisional ballot to be filled out, sealed in an envelope and stored apart from regular ballots. A county auditor or municipal clerk would then take all provisional ballots cast and, within seven days, review and either accept or reject them. Simon sees the proposal as problematic in several ways. For example, he said, some voter registrations could be wrongly challenged through simple data-entry errors. “We know that there are voters who have been erroneously marked as felons and have had their voter registrations challenged in error,” Simon said in letter to Senate Judiciary. It also likely will cause expensive administrative headaches for county and municipal officials and delay election results, Simon said. Asked why she thinks the change is needed, Kiffmeyer didn’t answer directly. She evoked the image of a 70-year-old grandmother acting as an election judge at a local polling place. Elderly poll workers like that might not be up to the task of handling voter challenges, she suggested. There is confusion about one key element of the proposed law: What happens if an outside election observer decides to contest a voter’s eligibility? Several sources contacted for this story say that, in their reading of the bill, if an outside observer contested a voter’s eligibility, that voter would be refused access to the ballot box and handed a provisional ballot. 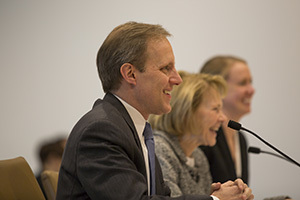 Among sources holding that view are Simon; Mitchell Hamline School of Law professor David Schultz; American Civil Liberties Union of Minnesota Communications Director Jana Kooren; Sen. Jim Carlson, DFL-Eagan, the State Government Finance committee minority leader; and Sen. Dan Schoen, DFL-St. Paul Park, a Judiciary committee member. Kiffmeyer sees things differently. A challenge to voter eligibility can only occur based on information supplied by state court, corrections or public safety officials, she told Judiciary committee members. “It doesn’t read that way,” Schoen replied. Simon insists that means an outsider’s challenge would trigger the provisional ballot requirement. “So I am worried that it includes not only the stuff that is in the system before game day, but also includes game-day challengers at polling places,” he said. Kiffmeyer, interviewed after the Judiciary Committee meeting, expressed surprise when informed of Simon’s comments. Asked several times to clarify whether an outside election observer’s challenge would trigger the provisional ballot requirement, Kiffmeyer finally declined, saying she needs to speak with the secretary of state first. Previously Kiffmeyer was affiliated with ALEC (American Legislative Exchange Council)which is funded by the Koch Bros. This sounds like a ALEC trick to further restrict voting. Members of ALEC prefer to remain in the dark but introduce legislation that they get when they attend Summer meetings at resorts where they are handed exact legislation that ALEC wants passed in their Legislative sessions. Koch Bros. firmly control state legislatures like Wisconsin, North Carolina, Kansas and more. 99.9% members of ALEC are republicans. In Wisconsin a ALLEC member introduced a bill with the ALEC logo on the top as he forgot to change it.